Fast, efficient snow removal is one of winter's most essential tasks for those of us who live in northern climes. While a snow blower makes this chore easier, it is not the quietest or greenest way to get rid of your snow. If you are determined to go "blower-free," here are some useful tips. Snow shovels have come a long way from what they used to be. There are a number of specialized varieties purpose-built for specific snow removal tasks, such as pushing, lifting, scraping, or throwing. Many come with ergonomic handles, although reportedly some of these actually make it harder to get the right angle for pushing and throwing your load of snow. A plastic shovel fitted with a metal blade will allow you to chop up icy patches, as well as move snow. You will even find shovels mounted on wheels, which are faster and easier to use than standard shovels (and less likely to cause back or heart trouble), without the drawbacks of snow blowers. A garden edger, with its strong, flat blade, is the best tool for breaking up ice. Use it like a crow bar to lift up sheets of hard ice. If you live in a blizzard-prone area (and recent weather patterns indicate an ever-larger swath of the country fits that description), be prepared. Keep your snow removal gear accessible, and know where to find it — in the dark, if necessary. You can’t use a shovel to dig out your car if you need to move the car to get to the shovel. Warm up with 10 minutes of light calisthenics before going outside. Pace yourself, take regular breaks and drink plenty of fluids. Don’t use shovels that are too heavy or long for you to use comfortably. Shovels with bent handles are designed to minimize stooping. Push the snow instead of lifting and heaving it, whenever possible. Lift with your legs, not your back, when necessary. Don’t throw snow over your shoulder or your side. This can strain your back. Dress to keep yourself comfortable and safe, in lightweight layers that can be removed as you heat up from your hard work. Make sure your head, hands, and feet are kept warm. Footgear should consist of sturdy, non-skid, waterproof boots or shoes. Anyone with a chronic health condition like heart disease or arthritis must -- repeat, MUST -- consult a medical professional before attempting to shovel snow. And if your doctor's prescription is: "Hire a professional to clear your snow," take this advice seriously. Try to start out by standing on a clear area and work from there. Don't walk back and forth over the snow before or during the process. 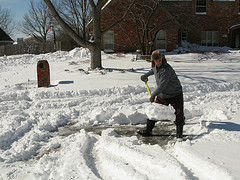 You'll end up making the task harder for yourself, since packed snow is much more difficult to get rid of. If you must get down a flight of outdoor steps in order to begin dealing with the snowfall, clear a small path to walk on. You may have to shovel the same driveway or sidewalk twice, but avoid shoveling the same snow twice. Start by shoveling the snow off cars; you don't want to clear the driveway just to rebury it in mounds of snow from your vehicles. As you shovel your driveway or path, dump the snow away from the cleared area so you won’t have to toss it again. Another pitfall to avoid is waiting until the snowfall is over to begin cleaning up the white stuff; snow tends to bond with surfaces, even before it's trodden on. Several small shoveling forays will end up being less work than one major one. Dig right down to the pavement to prevent ice formation. Planning in advance and covering your walk (or your car!) before a blizzard will help simplify snow removal. Secure a tarp or a snow windshield cover to your vehicle prior to a snowstorm to avoid having to dig it out from under mounds of snow. A tarpaulin on your walkway will collect snow, which can then be readily swept off. Alternatively, pick up the entire tarp to move the snow to a corner of your yard. You may want to use an ice and snow carpet, heated treads, or a heated mat to protect your stairs and landing. Deicer keeps snow and ice from sticking to the pavement if spread on your sidewalk an hour or two before a snowfall is expected. It will also help with snow removal if you apply it to flurries that have already fallen. Faster-acting than the traditional choices, solid rock salt (sodium chloride) or calcium chloride, liquid deicer can be applied with a battery-powered sprayer, making it a great shortcut, especially for those with mobility challenges. What's more, the liquid version tends to be safer for the environment and less likely to leave a persistent residue. Make sure that your deicer will not harm pets, landscaping, or concrete walks or driveways. In addition, it should be biodegradable and free of nitrogen, sodium, or chlorides. Finally, check on the neighbors. They may have been trapped by the blizzard, particularly if they are elderly or disabled. You may get an extra workout digging them out.